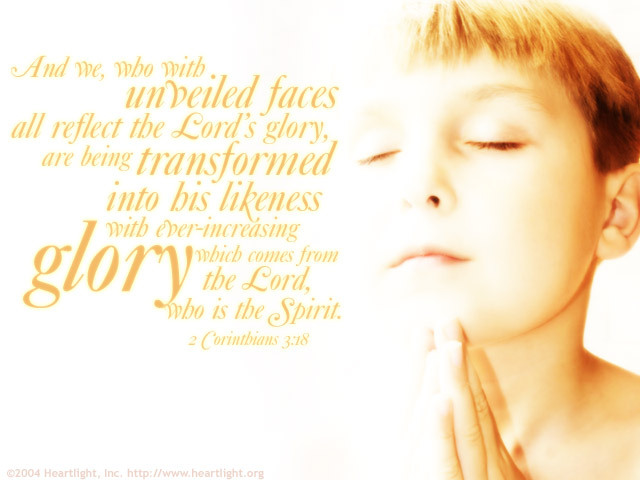 "Transformed ... with ever-increasing glory." In other words, it's an ongoing process, but with the continual help of the Spirit, we're going to arrive at our goal — to be like Jesus! The point is not to give up on our journey. Let's keep looking to Jesus and keep trusting that the Holy Spirit is doing God's work in us, making us more and more like Jesus each day. Father, please forgive me for the times when I've let my faith grow complacent and I've lost my focus on Jesus. Please bless me as I try to be more intentional in my plans, especially my spiritual maturity. Please make me more like Jesus each day. In Jesus' name I pray. Amen.